Our IT engineers are ready to take the strain when technology lets you down. We can manage your machines and troubleshoot any issues, remote or on-site. By delivering the daily essentials of office and catering supplies, we aim to keep you focused on what’s important. 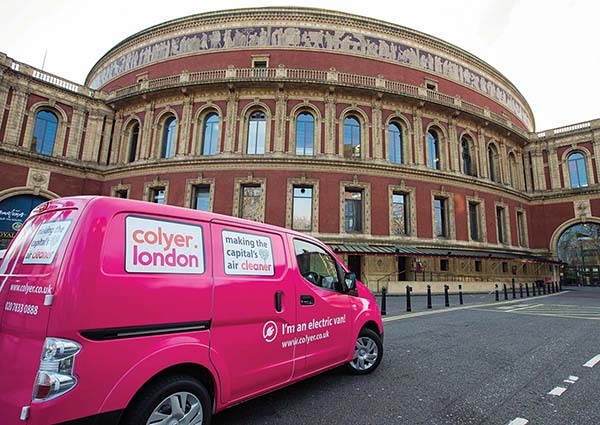 With our central London warehouse and fleet of electric vans we offer emission-free same day deliveries. Why choose Colyer London as your supplier? If you work for a creative department or agency in London, you’ll know what a chore it is to search for the right supplier. You need one who understands your business and its needs, who respects deadlines and can cope with ‘out of the box’ requests. Not all companies operate in the same way. Depending on yours, there may be one person centralising all requests, or there may be different folks for different strokes. Holding down the fort, you’ll be chasing suppliers and sorting out that persistent leak. Too busy to deal with multiple nationwide suppliers with warehouses in distant cities, you need a one-stop-shop-supplier with everything in Central London with deliveries in a few hours. Run ragged trying to keep everyone up to date, secure, online, and operational. You don’t have the resources to deal with Mac software, infrastructure & support as well as your PC’s. You need a highly-qualified external team of experts to give you a hand; in person, or remotely. Working all hours on clients & pitches with no time to perfect them. You’re fed up calling suppliers who know zero about studio & graphic supplies or how they can be used to achieve perfection, meaning you aren’t able to get the right media on time to make your ideas shine. FREE same-day delivery, emission-free in London! If we still had Diesel vans, we would be producing so much C02 and harmful toxins that 42.3 acres of forest would be needed to clean the air pollution, every year! How do all our services make us your one-stop creative supplier? Ready to have a conversation, or need to ask a question?